Excellent info, thanks for the education! It’s much appreciated. Thank you for the information. I have often wondered about secant, tangent ogives. now I know. EDITOR: Thanks for picking that up. Correction made. Does the increased bearing surface area of the tangent ogive, have a +/- effect on accuracy vs. secant ogive? My 6.5 A-Maxs(secant) seem to shoot better than Rem.PSP 140gr in my Swede. Hi, after reading the articles on Dan Liljas website including “Calculating Bullet Weights” I had to try out the code. There is another type of profile called a “Hydrid Ogive”. It is a combination of Secant and Tangent Ogives to blend the best of both to allow more forgiving entrance alignment through the throat of the chamber into the bore/rifling of the Tangent and still keep the aerodynamic advantage of the Secant. 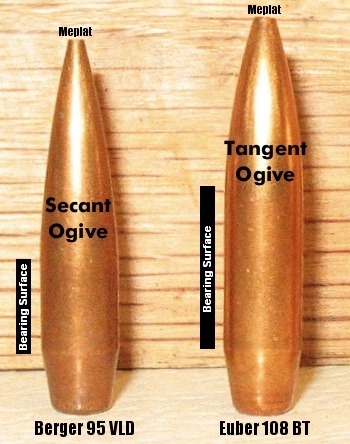 Tangent Ogive, though less aerodynamic than Secant, is the most common for factory and handloading because of its forgiving tolerance for chamber throat length differences and aligns with bore/rifling more easily. Secant Ogive is more aerodynamic and retains more velocity at longer distances like used in 1,000m or yard target,hunting,military uses, BUT Secant Ogive is more sensative to OAL (Overall Cartridge Length) and therefore more time consuming and critical to find “the OAL sweet spot” for each chamber throat length its used in as just a few thousanths of an inch difference in OAL can significantly change group size. Also there is a difference in muzzle velocity between Tanget, Secant and Hybrid Ofive bullets due to the length if Bearing Surface on each. Tangent Ogive has a longer bearing surface and more drag because more of the bullet surface is in contact with the bore/rifling. Secant Ogive has less bearing surface and less drag because less of the bullet is in contact with bore/rifling. Hybrid Ogive has less bearing surface than Tangent but more bearing surface than Secant so drag is in between both, but its primary advantage is in combining the better aerodynamics of Secant and more forgiving throat entrance of Tangent. Secant and tangent ogives affect different parts of the ballistic travel – secant the external ballistics, and tangent the internal ballistics. The problem with the secant profile is that because there is a smaller immediate bullet circumference forward of the front margin of the bullet’s body than is the case with a tangent profile, the tapered cone of the barrel Leade engages the bullet body later in the firing process. As the bullet moves and the neck of the case expands, the alignment of the bullet is no longer controlled, which can lead to loss of bullet longitudinal axis alignment with the longitudinal axis of the barrel as the bullet moves over the necessary jump distance required to avoid the overpressure spikes that would occur were the bullet to be seated in contact with the lands. The tangent ogive functions like a synchromesh in that it provides a more immediate contact and alignment force with the leade, and provides a less abrupt start to the engraving of the bullet rifling, which in turn helps maintain the coaxial relationship between the bullet and the barrel. That alignment force makes it less sensitive to seating depth variation; It is thus a superior leading edge for the start of a bullet’s travel. The secant ogive, on the other hand, excels in external ballistics because of its superior aerodynamic shape, leading to lower drag and superior downrange performance. Hybrid bullets combine the benefits of the tangent’s alignment superiority with the secant’s superior drag coefficient. Also, the lesser sensitivity to bullet seating depth of a tangent ogive bullet is retained with a hybrid bullet, and provides higher consistency of performance (accuracy) as the rifle throat erodes from firing, adding to the retention of precision of the weapon’s performance as it wears.